Lancaster is filled with little Mexican mom and pop places, and something about Taqueria Pepe El Toro jumped out at me when I was grabbing some items at the Home Depot across the way. So I decided to check it out. First thing I saw on the menu was Tacos Al Pastor. I always love Tacos Al Pastor. It’s my favorite type of taco, with nice seared bit of seasoned pork. Taqueria Pepe el Toro did not disappoint, these tacos were quite good, and both of the sides (rice and beans) were good quality as well. Really, I rather liked Pepe El Toro. 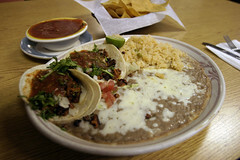 The food was good, very Mexican and not overly Americanized. The staff was very friendly, and the prices very good for the quality.